yeah, it's pretty clear i have little idea what i'm doing here, haha. The ideas i had in my head while picking these cards, was to try and make sure what cards i had in the higher tiers had to either be really powerful, and/or have trample on them. And then in the lower end, i tried to put reach and deathtouch to deal with whatever my opponent threw at me. 'most' of the cards in this deck i have 4 copies of each, so i can change things around as advised. The spell cards though, are where i don't have as much. The two you mentioned, i know i don't have though. I might have something that's card draw instant, but i'll have to look through the cards again and see. mainly, i want to build the deck around Ghalta, Primal Hunger, Gigantosaurus, and then probably Colossal Dreadmaw and/or Vulpine Goliath. out of those four, i have 7 dreadmaw's and 2 vulpines, but only 1 each of the other two. i'm thinking about possibly buying 1 or 2 each of ghalta and giganto though. Eilel on Ramping with Eldrazi! 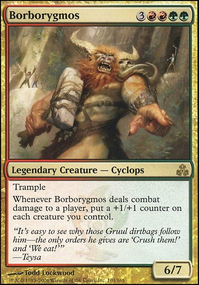 you could change Streetbreaker Wurm or Vulpine Goliath to Ancient Brontodon, for a larger power/toughness or to Brambleweft Behemoth or Colossal Dreadmaw. So there are a lot of different things that you can do to make this better, and the first is deciding on a theme. Decks tend to run better when all of the cards in them are to hit a certain goal. You have too many floating around (lifegain, counters, midrange, trample, mill, etc). Pick one or two that would work best together, and then choose your cards. With a deck like this that has so many cards that require 4+ mana, you'll want more than just land. I recommend adding something like Cryptolith Rite, Llanowar Elves or Sakura-Tribe Scout. Without adding ramp, you'll have to wait until turn seven or eight until you can have the seven mana to cast Sifter Wurm. You'll also want to avoid adding lands that are tapped unless necessary. The effects that they have are useful, but having them slows you down. Find a balance. Personally, if this were my deck, I would add a splash of white deck so that I could base it around Concerted Effort. 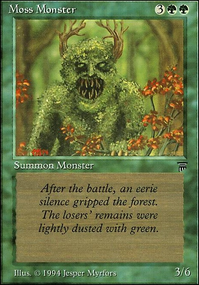 Not only would I have a strong mana pool from the green ramp, but I would also have the range of effects from the powerful green creatures. Doing something like this is an excuse to have a ton of different concepts throughout the deck. You just have to be smart about it. I would honestly cut out Vulpine Goliath. Also, Vines of the Recluse and Highspire Infusion and find a card or two that helps all of your creatures, not just one. At a glance, I would strongly suggest that you try to change out some of your cards for the strictly superior versions. 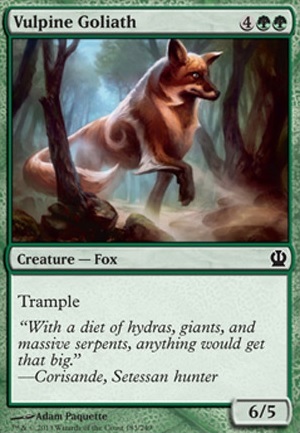 For example, why have Vulpine Goliath or Enormous Baloth when you could have two more Terra Stompers? It isn't as if you're making any mana that isn't green. Little changes like that would not only make the deck stronger overall, but it would also make the deck a lot easier for people to glance at, see the themes you are looking for, and help improve on those. 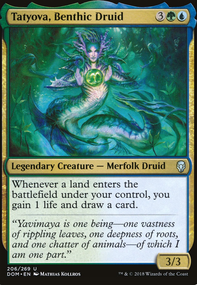 Also, if you plan on running Leaf Gilder, I would encourage you to trade it out for Arbor Elf, Elvish Mystic, or Llanowar Elves. After all, you have plenty of big creatures to attack with, so you want to mostly use these cards to make mana. All three of those cost less to play that Leaf Gilder, so you can play them earlier and get their mana sooner or play them on the same turn as another card more easily. If you like Mono- stompy, I highly recommend Omnath, Locus of Mana as your commander, as he both ramps you can grows ridiculously large with any unused mana you have. Hope this helps! 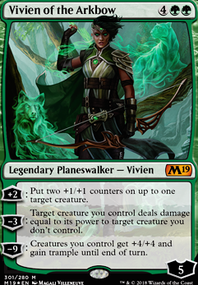 In addition, I recommend buying a preconstructed Commander deck for anywhere from $25-$50; they have some valuable cards and some pretty awesome commanders! 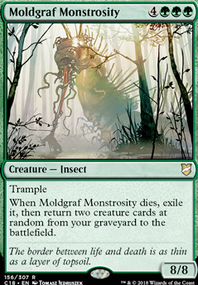 Mono-green pump. Encourages players to play offensively and make smart decisions with their mana. My main concern with this deck is the inclusion of Thundering Tanadon. 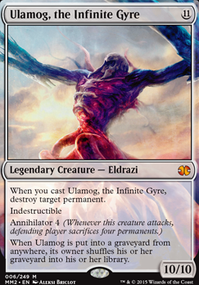 Is phyrexian mana too weird to be in a starter deck? Mono-white soldier tribal. Encourages players to know how to utilize synergy between a creature type, and handle multiple situations by using a multitude of answers. Encourages players to learn artifact synergy, combo plays, and elements of control.